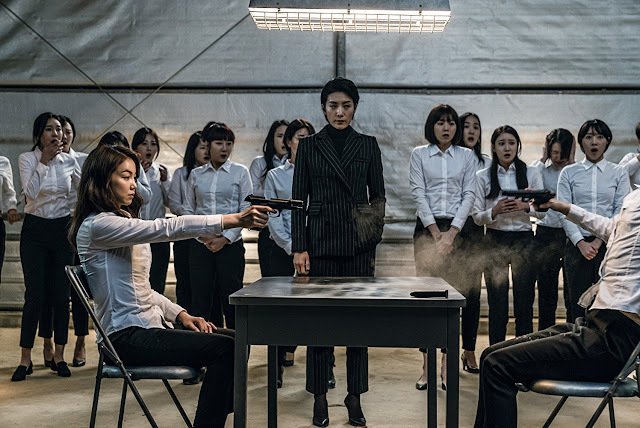 Jung Byung-gil’s latest movie wears its influences on its sleeve but still manages to find it’s own beats in this High-Octane action thriller from South Korea. After taking revenge on the men who murdered her father, Sook-hee (Kim Ok-vin) is captured and initiated into the National Intelligence Service. Given a new identity and trained to become an assassin, she is given the chance of a new life for herself and her young daughter. As one mission progresses, she starts to learn the truth behind the murder of her father and that the past she thought was long buried is about to erupt with tragic consequences. They say all artists steal and Jung Byung-gil is no exception here as his movie references several renowned action movies from recent history. The opening sequence brings back memories of “Old Boy” in its downtrodden corridors. There are strong echoes of Luc Besson’s seminal “La Femme Nikita” with its tale of a trained assassin slowly finding their humanity and “Kill Bill” is explicitly referenced in a flashback sequence. All of these references mean nothing however, unless the filmmaker can create a movie with its own identity and to a large extent it succeeds. The opening sequence is one of the most breathless in recent vintage. Shot from a point of view perspective, the audience is literally thrown into the action through a dazzling combination of camerawork and editing. Indeed such a sequence would serve as a movies conclusion but we still have almost two hours to follow. The initial training sequences take those from “La Femme Nikita” and give them more of an edge with a more ruthless approach. As a consequence, the pacing of the movie, inevitably, begins to sag as the melodrama kicks in. The paradox of the developing relationship is that it is based on a lie. Sook-hee and Hyun-soo’s courtship never rings true and indeed Hyun-soo’s developing love for Sook-hee feels more a rudimentary plot device, given his earlier introduction showing him making notes on her interests, as he sees her as a route to promotion. The other part of this love triangle, Joong-sang’s mentor\lover, also lacks development, which makes it difficult to care for the protagonists once the tragic elements kick in. A potentially interesting character, another member of the National Intelligence Service, is killed off suddenly, halfway through, and Chief Wong, unfortunately, becomes a caricature of the hard-as-nails boss after an excellent introduction. Kim Ok-vin is exceptional in the action sequences, believably becoming a force of nature in the very physical action scenes. When being the cold, emotionless killer she is very convincing. Unfortunately, she has less impact in the more dramatic sequences, although in fairness the script’s weaknesses are what hinders her as the plot becomes more contrived. Jun Sung is also hampered by this problem. Whilst demonstrating an amiable presence, his character’s introduction completely sabotages any audience empathy and the inevitable relationship with Hyun-soo and Sook-hee never really recovers. Ha Kyun-shin fares better, as has a little more to work with and the machinations of the script suit his character as the truth behind Sook-hee’s father is revealed. Interspersed in the melodrama are several well shot action sequences. Jung Byung-gil clearly knows how to position the camera so that the scenes are clear, with Sook-hee always at the heart of the action. This is where the film develops its own identity and is more than just a collection of film references. 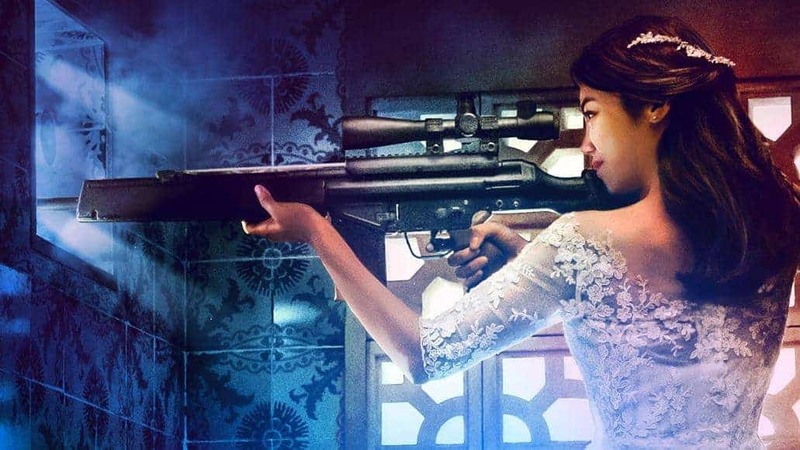 A swordfight on motorbikes and a crazed car chase down the night-time streets see the movie capture a kinetic energy that is exhilarating on a par with the best of Asian action cinema,. Unfortunately, whilst these action sequences raise the bar to a high level, it is the melodramatic elements that prevent it from being a modern classic. “La Femme Nikita” is the film it resembles the most, and that movie had at its heart a conflict between the heroine and the two lives she lives. There the relationship that develops is real whilst here we never really feel that there is such a conflict, as the alternative is clearly outlined at the beginning as a setup. Indeed, both relationships at the core of the movie are revealed to be a contract. What is real turns out to be fake and what starts as fake is supposed to become real. Yet, by playing one if it’s cards early, it strips the movie of an emotional connection and so it ends up becoming like its central character. Coldly efficient but you never get the feeling that there is any depth.